Scheuermann's disease. 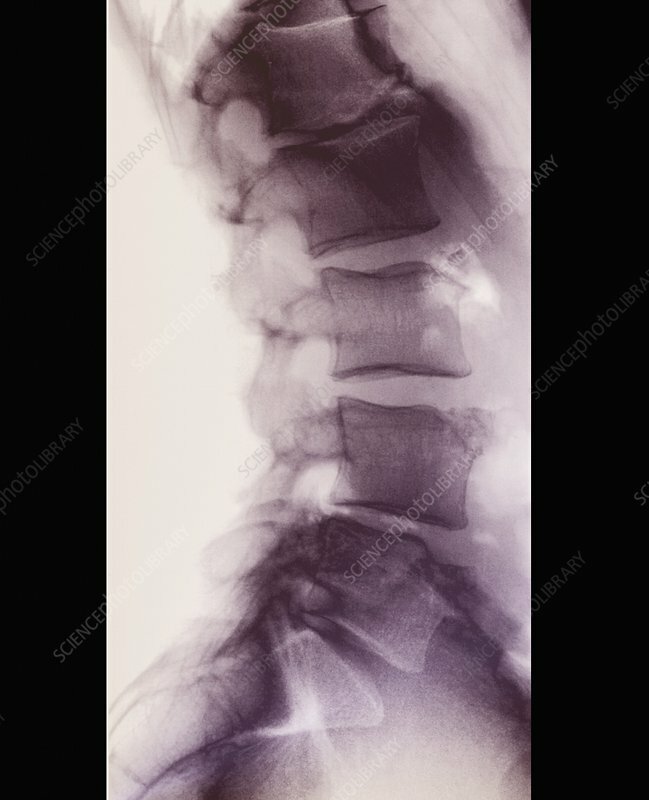 Coloured X-ray of the lumbar (lower back) vertebrae of the spine of a 40-year-old patient with a history of Scheuermann's disease. Front of the body is at right. Scheuermann's disease is considered a juvenile type of osteochondrosis (degeneration and calcification of bone-forming areas) that affects the spine below the neck in teenagers. It causes backache and spinal curvature, and, in very serious cases, may cause internal problems and spinal cord damage. Here, old existing irregularities of the L1, L3, L4 and L5 vertebral plates are suggestive of past disease.